Ensure clean water by employing proven grey infrastructure technologies, and expanding the use of green infrastructure for storm water retention and treatment. Transform elevated portions of the Major Deegan Expressway into green infrastructure to capture storm water. Transform the street-level into a lively social space with lighting and public art. Remediate and build a park at Pier 5, showcasing BMPs for storm water management on former brownfields, and restore wetlands. Wherever possible, restore the natural waterfront edge to rebuild the river ecosystem. Specific sites where this restoration could be accomplished include: Spuyten Duyvil, Roberto Clemente State Park, Depot Place Park, Mill Pond Park, Pier 5, and the river edge at the Harlem River Railyards. Create new waterfront public open space by converting street ends into vest pocket parks that combine access, boat launches, and water transport hubs. Encourage boating on the river by adding capacity for boat launching and storage. Prioritize locations in close proximity to underserved areas, such as Lincoln Avenue, Park Avenue, Depot Place, and Regatta Park (north of Fordham Road). Reclaim for public use the waterfront park property currently used for parking for Yankees games. 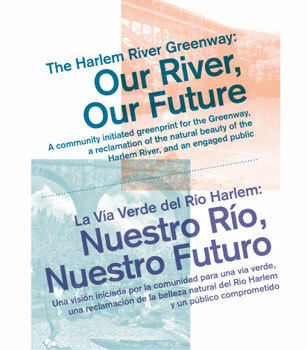 Provide access to the river from various points along the Harlem Rail Yards. Change how people utilize and think about the river by transforming it into a "water trail," where water buses or ferries transport patrons to Yankee Stadium on game days and Bronx residents from place to place along the river. Build the greenway along the water, where feasible. This might result in a tow path or decked waterfront platform in areas made inaccessible by rail line or other obstructions. Mark the juncture of the South Bronx Greenway and Harlem River Greenway at Randall"s Island connector with well-lit pedestrian and bike paths, with nodes that include fitness zones, interactive art, murals, and green walls. 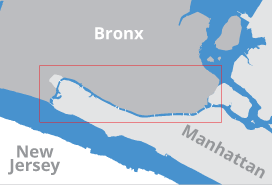 Build Regatta Park on the one-acre parcel just north of Fordham Road. Ensure that the public has full access to the river along the CSX site. Eventually, acquire the full CSX site for public open space. Make Roberto Clemente State Park the premier gateway to the river and Greenway with improved signage, a bike path, access to the water, improved programming, and storm water capture.